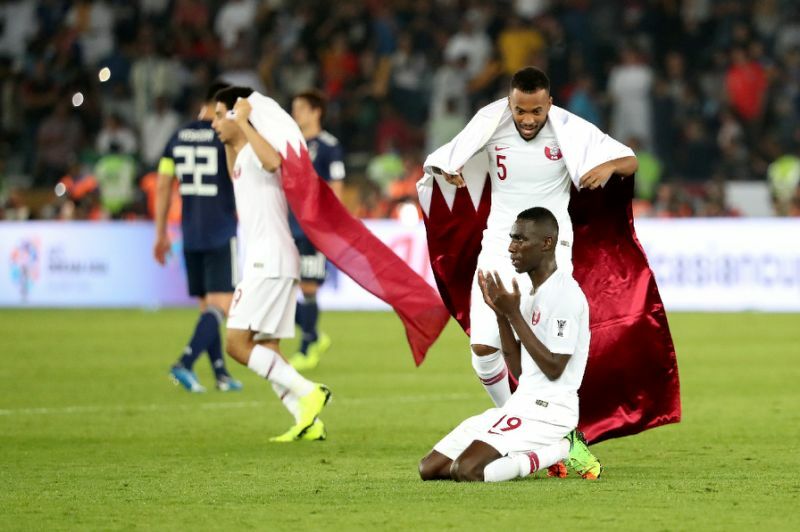 Abu Dhabi (AFP) -- Qatar stunned Japan 3-1 to capture their first Asian Cup title on Friday sparked by a moment of jaw-dropping brilliance from record-breaker Almoez Ali and after a controversial late twist. "We made history for our country," said Qatar coach Felix Sanchez. "We need to be proud of this achievement. It's one more step towards being ready for 2022." Qatar survived a wobble at two-nil when Takumi Minamino pulled one back on 69 minutes, only for Uzbek referee Ravshan Irmatov to award the Maroons a penalty on review for a handball by Japan captain Maya Yoshida. "That's one of the toughest ways to lose," a distraught Yoshida told AFP. "That third goal is tough to accept. It killed the game. If that's a penalty probably I'll have to jump without using my arms." Surprise package Qatar had never before gone beyond the Asian Cup quarter-finals but they scored 16 unanswered goals coming into the final and kept a record six clean sheets. But moments later Afif ended Japan's resistance with a cheeky dink from the spot to complete a fairytale triumph for Qatar. "We are definitely proud of this," said Ali after the Qatari players were showered with golden confetti at the trophy ceremony.